Families, early care and early education professionals/providers, and child care resource and referral agencies, all share a desire for young children to have the best possible start in life. 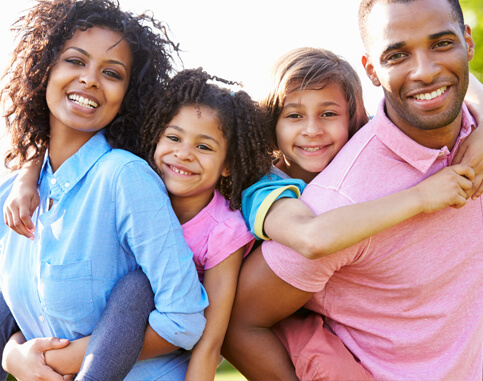 At Child Care Aware® of America, we are a solution-centered leader offering tools and resources that unify and enhance family well-being, academic outcomes, and lifelong success. Family engagement is about fostering mutually supportive relationships! It’s the interactive process that brings together parents and other family members, children, and early childhood professionals at all levels. Everyone works together in service of children’s learning, healthy development, and well-being. As a parent, grandparent, aunt/uncle or other caregiver in a child’s life, you see the benefits of working in close partnership your child’s early care and education provider firsthand. This section will support engagement and advocacy opportunities in your child’s early learning at-home, the community, and in their child care and education settings. Quality consumer education and engagement practices reduce barriers families face when accessing quality child care by ensuring they receive quality information that supports their roles as decision makers and advocates. Policies, such as those in the Child Care Development Block Grant and Child Care Development Fund final rule, open up new opportunities to enhance these practices. Finding and selecting child care can be a difficult and overwhelming task, from knowing where to start looking for child care to knowing how to choose the right one for your child and family. We give you the tools you need to find a child care provider that gives you peace of mind while you're away from your child and can connect you to local child care support in your own community. A young child’s brain develops the fastest during their first 5 years of life. Although the most immature organ in the human body at birth, by age 5, the brain has grown to approximately 90 percent of its full size. Our partnership with Vroom brings brain science to life! Through parents, families, providers and our vast network of Child Care Resource and Referral (CCR&R) agencies, we can make everyday moments, brain-building moments.